Home > News > News > Coming Soon – The AMT Band Plays ABBEY ROAD! Coming Soon – The AMT Band Plays ABBEY ROAD! WITH A LITTLE HELP FROM OUR FRIENDS, The Beatles, we’re gearing up for our third original show of 2010 – The AMT Band Plays ABBEY ROAD! COME IN THROUGH THE BATHROOM WINDOW or come through the front door, but COME TOGETHER for this sensational Beatles event! Join ELEANOR RIGBY, LUCY IN THE SKY WITH DIAMONDS, SGT. PEPPER and HEY JUDE for this magical evening of Beatles hits! THE END! The AMT Band Plays ABBEY ROAD – Purchase tickets here! 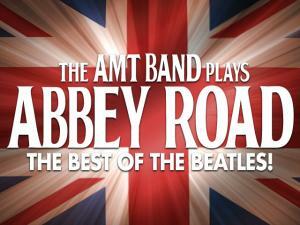 Check out the official AMT Band Plays ABBEY ROAD website!